Back on the bus. We hurry as we don’t want to be left behind. But it is hard to leave the beach–even when hazy. Oh, we are going shopping now? OK Let’s go. Entering Souk Madinat Jumeirah. This looks new and pretty fancy. Near the entrance arch, we can see Burj Arab. We just left that beach. 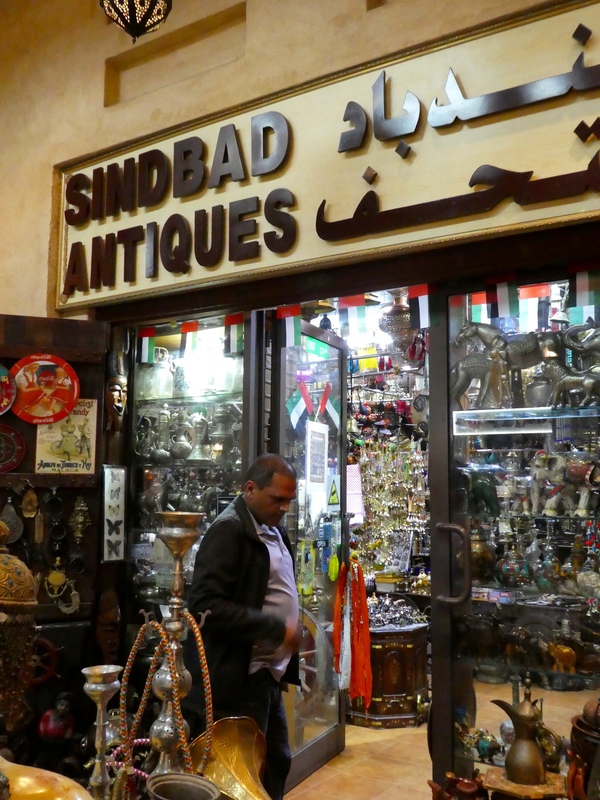 Inside the souk, we see many things that we do not see at the Denver, Colorado malls. These are great shoes. Our moms look, but no new shoes coming with us. This is my new friend. He is selling more things we do not often see at home. Mom and I go to antique shops at home and we think this store looks very interesting. But, after walking around more of this area, we realize we are out of time. The bus is taking us to our hotel, The Hyatt Regency. We are near Dubai Creek in the Deira area of Dubai. 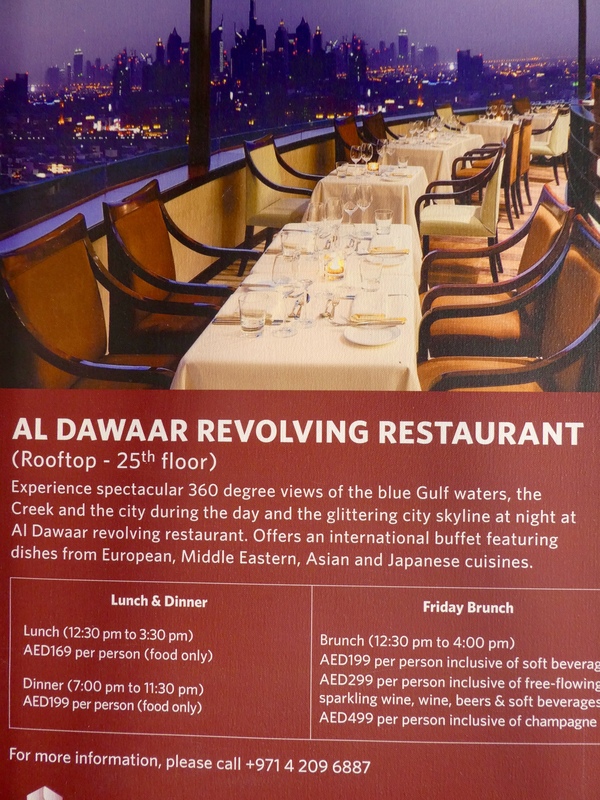 That is a revolving restaurant at the top of our Hyatt. Chanel the Bear, and I, Zeb the Duck, took our moms there one evening. We ate here. Loved it! The food was great, the views suburb and we had a lovely evening. But, our human moms forgot to take pictures of us. What to do with those humans? 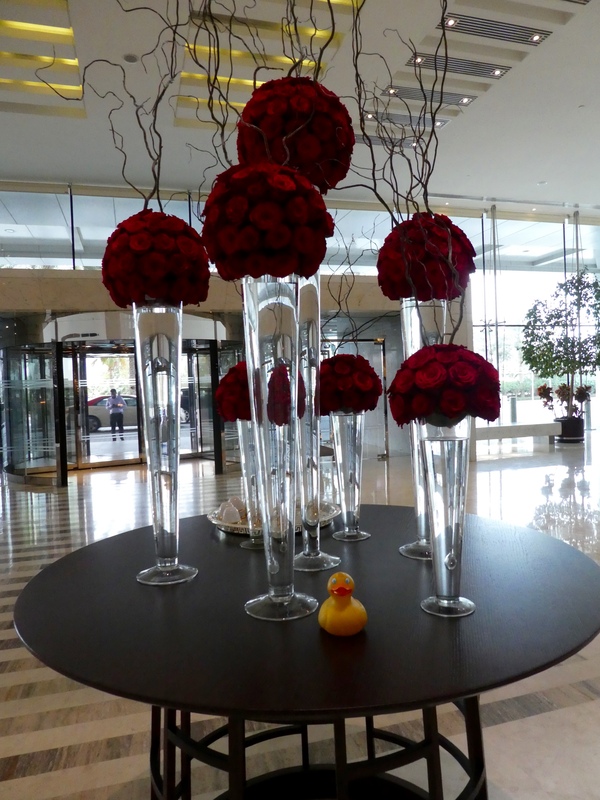 Entering the Hyatt Regency we loved all the red roses. 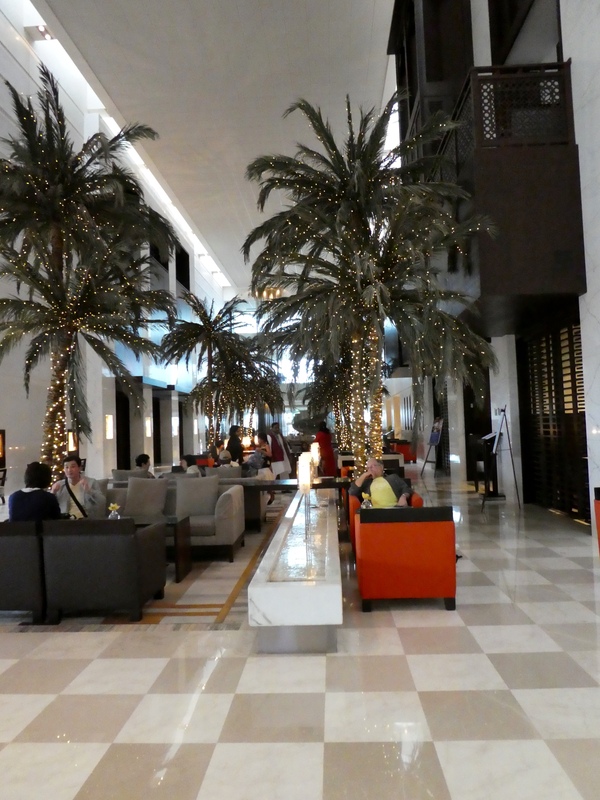 The lobby is decorated with many fresh flowers and thousands of small lights. It seemed so festive for a small bear and a rubber duck. I love spiral staircases. 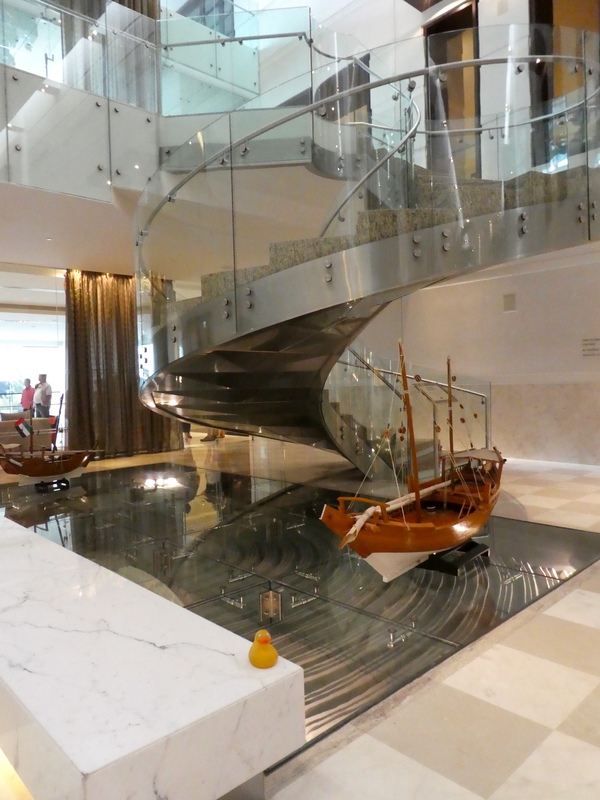 Spiral staircase and a boat. I love it! And I especially loved this ship. 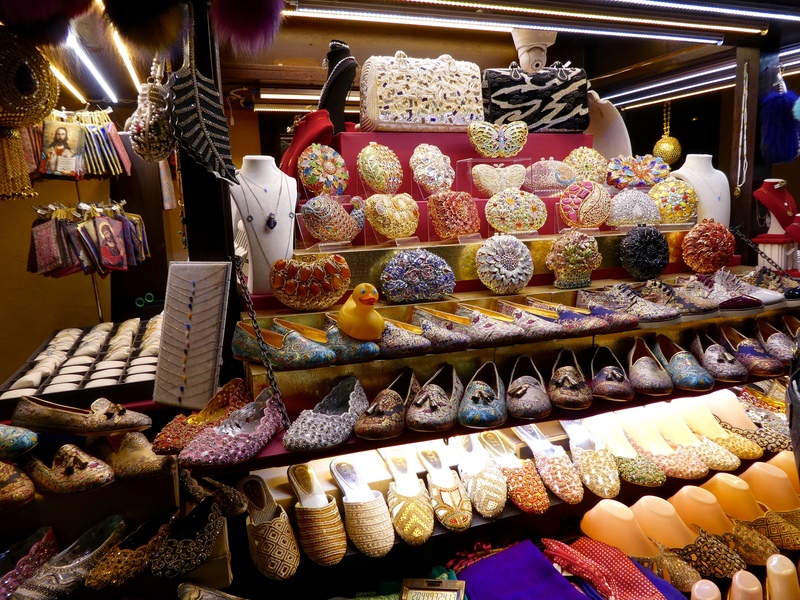 Our hotel has a shopping arcade, and do you know what else? 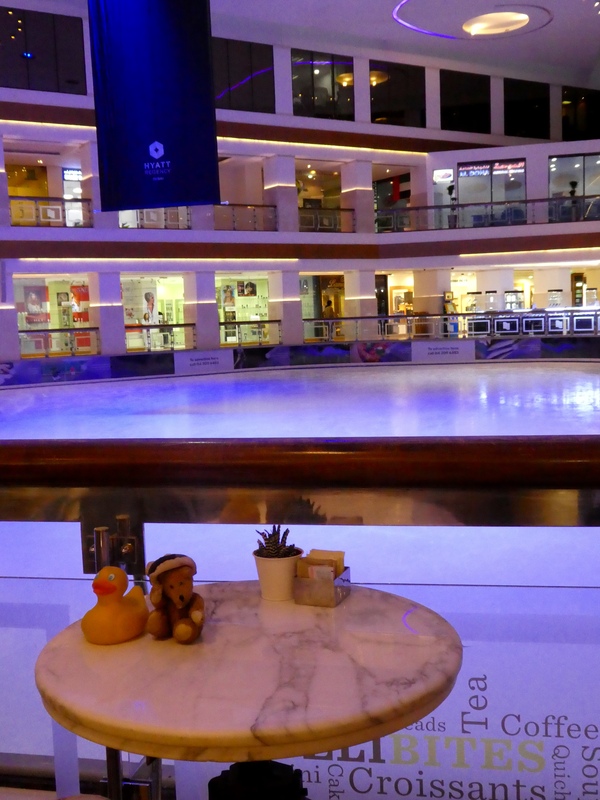 We have an ice skating rink in our hotel. Ice skating rink in our hotel. And a snack bar. 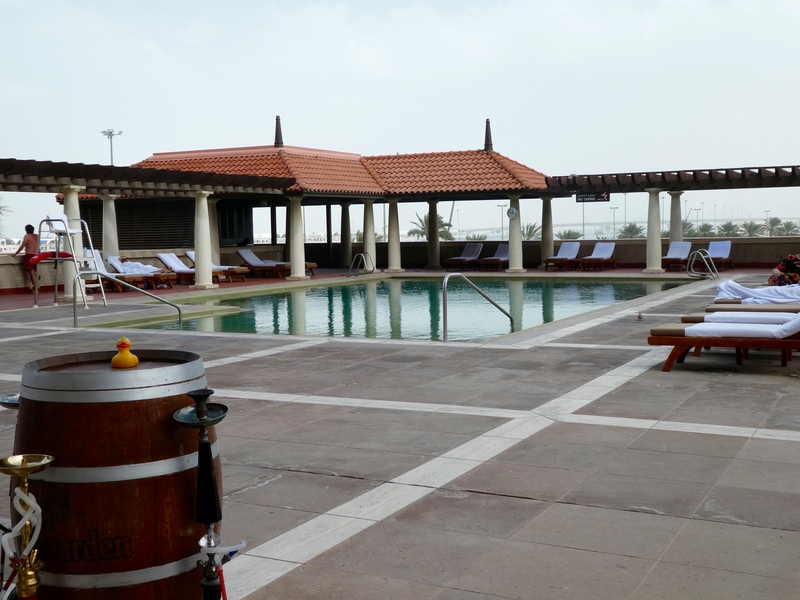 Our hotel has a roof top pool. The roof top restaurant would be a perfect place for Chanel and I to have lunch. 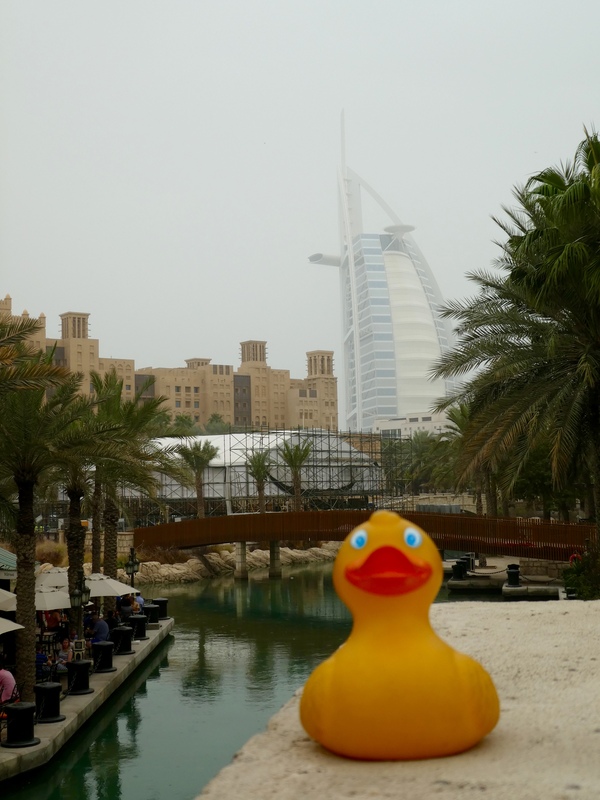 However, the humans were too busy trying to see many things in Dubai. Nice to know that they are ready if we want dinner and it gets a little cool. It does get cool in the desert. 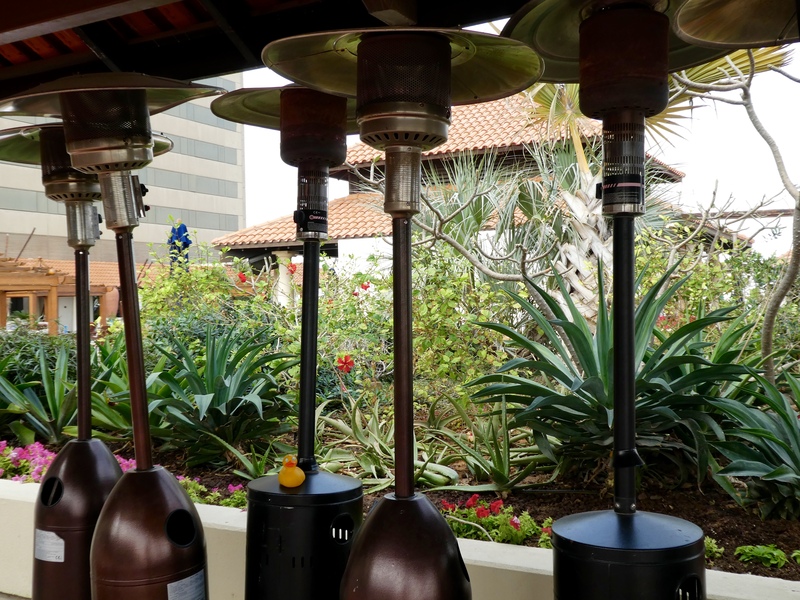 This hotel, and all of Dubai, seem to be ready for anything. 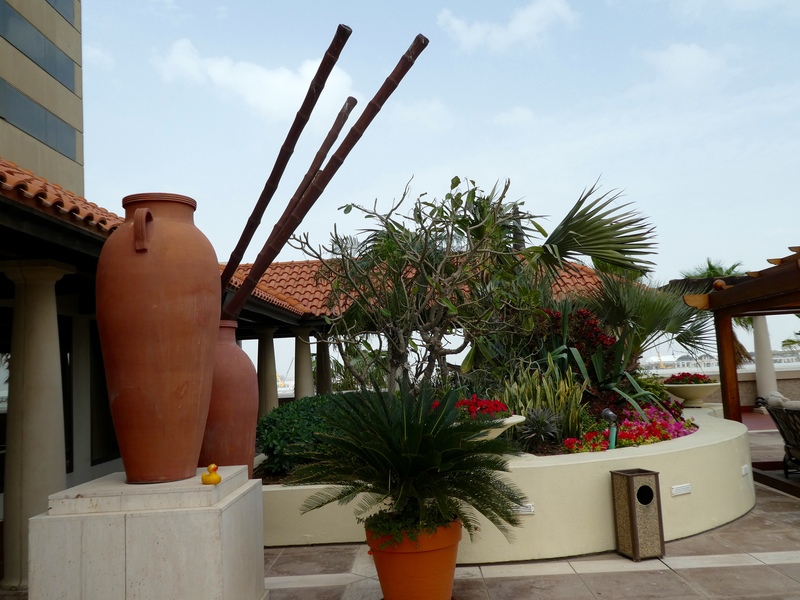 Aren’t these flowers and large pots beautiful? 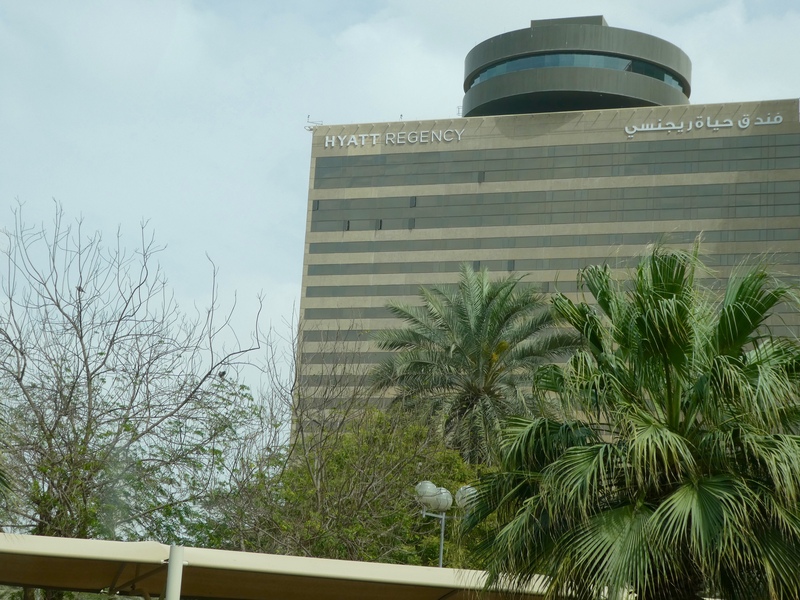 We really like the Hyatt Regency and Dubai is fascinating. 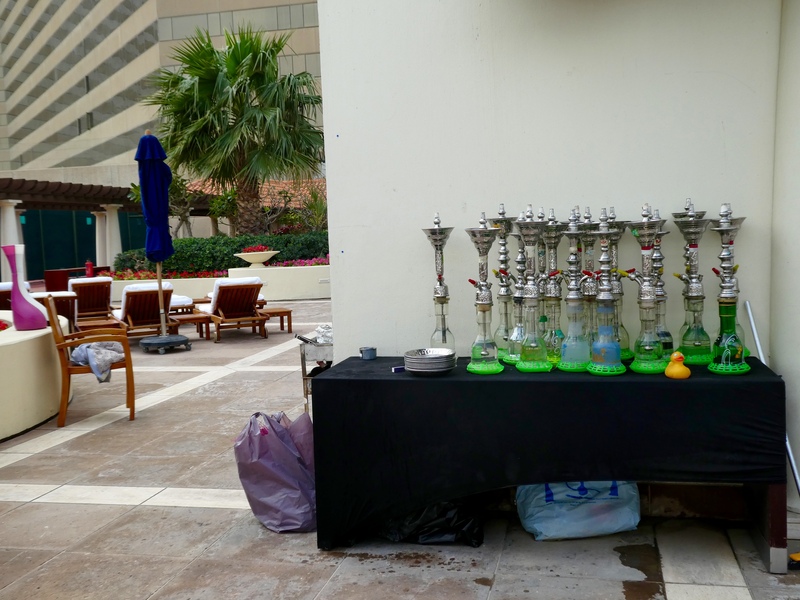 This entry was posted in Dubai, Uncategorized, United Arab Emirates and tagged Arabic shoes, Colorado Traveling Ducks, Dubai, Hyatt Regency Hotel, Revolving rooftop restaurant, Souk Madinat Jumeirah, United Arab Emirates. Bookmark the permalink. Thanks. We had a great time there. I believe that is where you found the license plates. 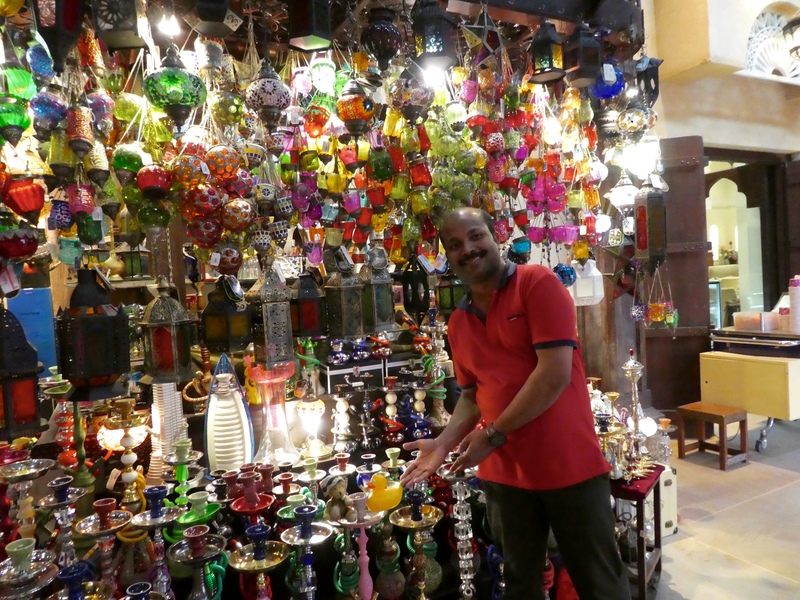 There’s so much to see in those souks. I’m impressed you didn’t buy anything! It was fascinating. Hard not to buy stuff. But always more shopping opportunities. Thanks for reading and commenting.